If you’ve spent years building a business, selling it can be a difficult decision to make. Sometimes you just can’t run it any longer, or you may simply want to move on to something new. However, even once that decision is made you then have to consider what you are selling and the different tax implications of this decision. As part of a goodwill and asset sale, the buyer taking control of the business is effectively buying its assets. Those assets include physical items such as property, machinery, and stock. It may also include non-physical assets such as intellectual property, trademarks, and patents, as well as the goodwill of the business hence its name. From the buyer’s point of view, this type of sale can be advantageous as they can pick and choose the bits they want and reject what they don’t. Having said the buyer can pick what they want, it should be noted that all employees are usually transferred to the new owner with their employment rights protected under TUPE. 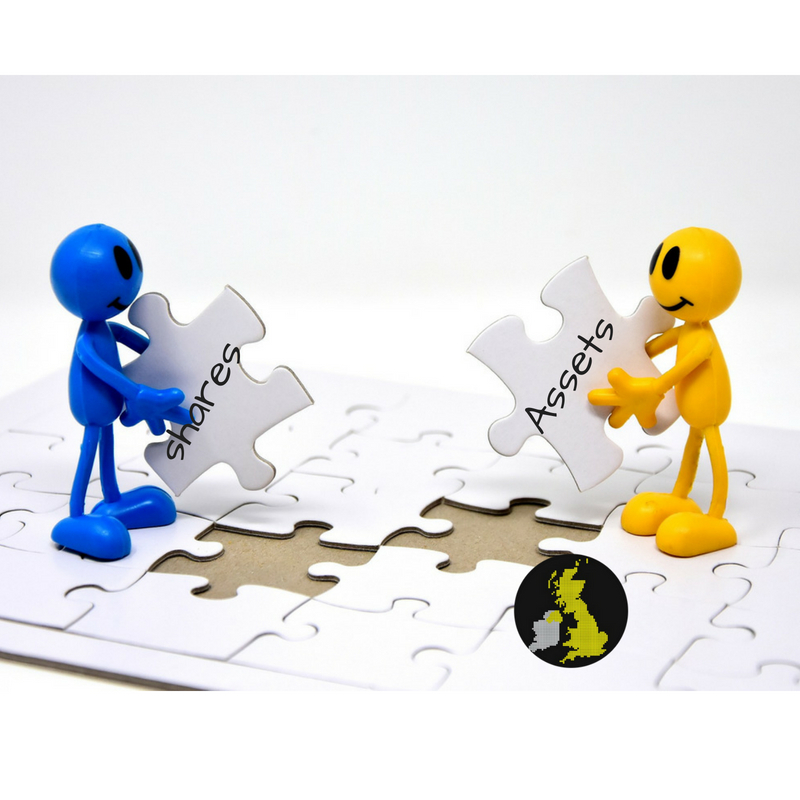 The advantage of a goodwill and asset sale is the ability to leave behind liabilities you do not want, however, it can involve significant disruption to trade, e.g. new customer and employee contracts, a new bank account for payments, new supplier credit limits to agree etc. So if your main concern is ongoing trade a share purchase might be better. A share sale is where the buyer acquires the shares of the company that owns the business. In the reverse of a goodwill and asset sale, the buyer of the business inherits all the assets, liabilities, and obligations that go with the company, warts and all. That may include warts you don’t know about! As a buyer please see our article on using warranties to protect yourself. However, you have one significant advantage – commercially there is no change in how the business trades to the outside world. No new contracts or negotiations, just business as normal. If you are buying the business for its ongoing profits, then surely the less disruption the better. From the above Goodwill is not a prerequisite of either sale type, although it’s often present and reflects the ongoing level of expected profits. For tax purposes, a share sale is usually considered a more attractive prospect for the seller. A goodwill and asset sale is a better bet for the buyer. When selling any asset for a profit, we’re all liable to pay Capital Gains Tax (CGT) personally, but a company pays corporation tax on any profit made. It’s important to remember that tax is only levied on the financial gain you’ve made and not the actual amount of money you receive from the transaction. For a fixed asset (excluding investment properties) then the gain would normally be measured against the written down tax pool value of the asset. For goodwill, you would seek to set off the cost of any intangible assets. However, both these calculations should be referred to an accountant, as there are certain rules (we are talking tax remember!) that need to be factored in. A company would normally pay corporation tax on the profit it makes from the sale of an asset. In 2017/18 this stood at 19%. by closing the business and trying to obtain Entrepreneur’s relief (see below). This is when it can become very expensive for a seller to sell via goodwill and assets. However, a buyer can write off the cost price of the assets against future profits. As shares are an asset the tax rules governing capital gains tax apply (CGT) apply, but if you qualify for Entrepreneurs relief then the rate currently is a very low 10% of the gain over the price paid for the shares. This, generally, means a share sale is better for a seller. However as a buyer can’t write off the cost of the shares, then they prefer goodwill and assets from a tax standpoint. For those selling all or part of their business, it may be possible to claim Entrepreneurs’ Relief on Capital Gains Tax. This benefit effectively reduces CGT to 10% on the first £10m gains you make from selling such assets over your lifetime. Anything over this will be taxed at a rate of 20% (as at 2018). You’re eligible for Entrepreneurs’ Relief if you control at least 5% of the shares or assets you’re selling, you’re a sole trader or partner selling your part of the business, or to extract cash after an asset sale within three years of it closing down. It doesn’t apply to property-letting businesses unless they’re furnished holiday lets. From the above, it can be seen that there are many factors to consider when you sell or buy a business. Price is only the starting point to ensure that you agreeing to the best terms. At Business Partnership we’ve helped thousands of entrepreneurs buy and sell their businesses over the last thirty years. We can help you design the right deal to maximise the value and, working with your accountant, help you minimise the tax paid as well. Find out more.